Who isn’t drawn to the delicious sparkle of a beautiful diamond? For anyone celebrating an April Birthday then the divine Diamond is your birthstone, which is a great excuse to treat yourself to one of the most sparkly, sought-after and celebrated gemstones! Julian Stephens is a passionate collector of Gemstones with a wide array of Diamonds which are available to purchase and use in one-off, bespoke creations. Learn more about Diamonds, the Birthstone for April and view beautiful contemporary Diamond Jewellery by Julian Stephens on our blog. The Diamond is the birthstone for April, learn more about gemstones, birthstones and geminology in our blog series exploring these subjects. Julian Stephens loves to work with conflict-free Diamonds and many of his finest contemporary jewellery designs and bespoke, custom-made creations use this stunning gemstone as a centrepiece. Diamonds are the very hardest natural substance and scratches or damage to their surface can only be caused by another diamond. This durability and practicality explains why Diamonds are so favoured in rings which are worn everyday (like engagement or eternity bands) and as so popular for creating Heirloom designs, special pieces of fine jewellery designed to be enjoyed by generations of wearers. Julian Stephens has a wide range of beautiful Diamond Jewellery designs which are ready to buy, adore and treasure! You can find stunning fine Diamond engagement rings, wedding bands and fine jewellery available to purchase through our website, each piece hand-crafted with care and expertise. April’s Birthstone, the Diamond is featured in our blog exploring geminology and birthstones. To learn more about the Science and folklore of Diamonds visit our new blog. Diamonds are billions of years old, composed of almost entirely one hundred percent Carbon which is formed under the immense heat and pressure below the earth’s surface, where these Carbon atoms uniquely bond to create the beautiful, naturally occurring crystalline structure of Diamonds. This incredible natural process happens hundreds of miles below ground and Diamonds only find their way to the earth’s surface from deep volcanic eruptions to create these coveted, precious gemstones. Firstly make sure you find a supplier of ethically-sourced Diamonds to ensure your stone is conflict-free. Any reputable and experienced Jeweller (like us, for example!) will talk you through how and where they source their stones. Diamonds are selected and graded for quality by a method known as the “4Cs” which refers to Carat, Cut, Colour and Clarity. 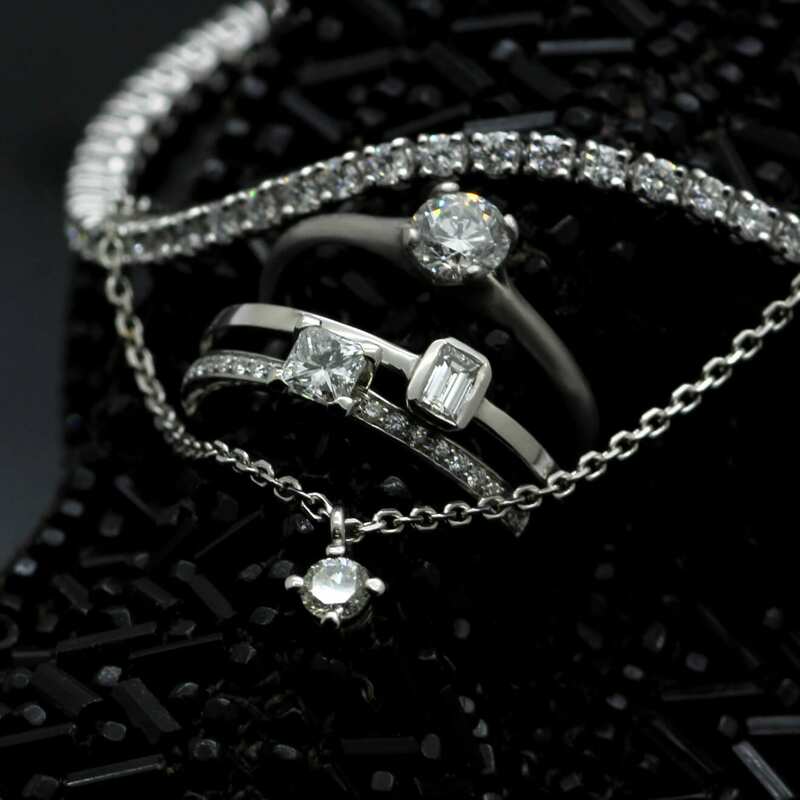 A handy tip is that the above categories are equal in importance to the Diamond’s quality and value. This means you can select a Diamond with a particular combination of these attributes to suit your design, the occasion and of course your budget! ** Carat** The word “Carat” is thought to be derived from the Carob Bean – an ancient unit of weight. In the modern world the term Carat is a defined unit of measure for classifying the weight of gemstones and is most commonly associated with Diamonds. Cut Cut is the shape and cutting style of a diamond. The cut, polish and proportions of a diamond will determine the final shape of the stone and the design of the facets which help emphasise the all important sparkle! Colour Diamonds are found a variety of naturally occurring colours (caused by impurities, heat or irradiation like any other Gemstone.) 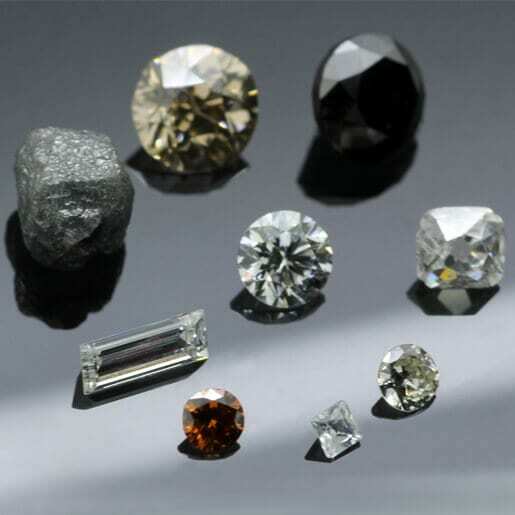 There are more than 20 subtle grades of Diamond colour, identified in alphabetical order from D-Z. Naturally coloured Diamonds are rarer and depending on the tone more expensive. 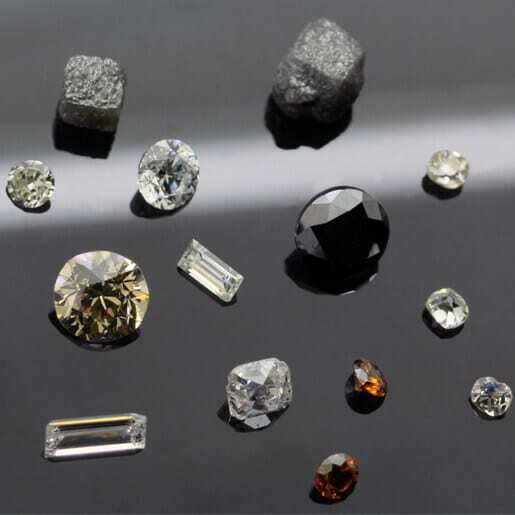 Technology developments have improved the quality and costs involved in artificial coloured Diamonds which can be purchased in a rainbow of different hues. Clarity Natural Diamonds contain naturally-occurring features or Inclusions which are typically invisible to the naked eye, these tiny marks are minerals or fractures which appeared while the diamonds were forming in the earth. The number, type, colour, size and position of these inclusions can affect the value of a diamond; flawless diamonds are rarer and therefore much more expensive.